Delhi Chief Minister Arvind Kejriwal’s Maruti WagonR, which went missing two days ago, has been recovered. The car was found abandoned in Ghaziabad, near Delhi. Police officials are trying to nab the accused by examining CCTV footage. The accused is said to be visible in the CCTV footage captured at the time of abandoning the car. 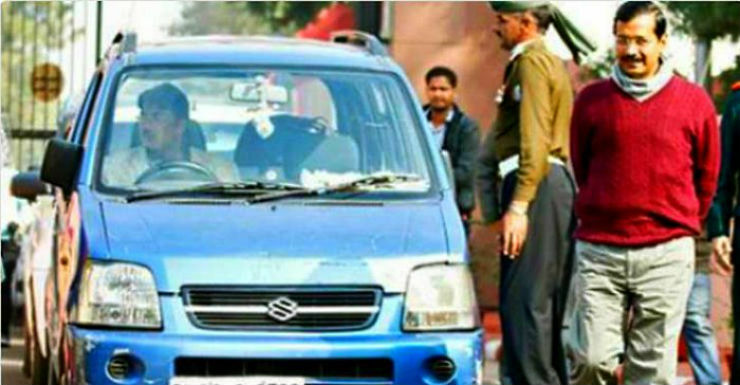 Though it belongs to him, the car was not used by Arvind Kejriwal at the time of theft. It was being used by one Vandana Singh, a youth wing leader of the Aam Aadmi Party (AAP). The car was parked outside the Delhi government headquarters when it was stolen. Kejriwal now uses a Toyota Innova bought by the Delhi government. My Wagon-R car was stolen outside the Delhi Secretariat. My car getting stolen is a small matter. But the fact that it went missing outside the Delhi Secretariat reflects the rapidly deteriorating law and order situation in Delhi. I want this car back. There are a lot of emotions, memories attached to it. Whoever returns the car, I will give him a suitable reward, which will be much more than what he will get from selling the car. Now, that the WagonR has been found anyway, the focus now shifts to the person who stole the car. We hope that the authorities quickly nab him for it will send a strict message to those who steal cars. It’s quite easy to steal older models of cars like the Maruti WagonR, which do not have engine immobilizers in them. Newer cars have engine immobilizers, which act as a theft deterrent to a certain extent at least.